You may not have noticed but Web 2.0 has given math education a kick start. There are now ways of teaching and learning math that were nearly impossible just a few years ago. Today there are cohorts of pioneer educators who are experimenting with how to use Web 2.0 in the teaching of math. Early returns show much promise. But whether it delivers the goods or not depends on how it is implemented. Take for example the opportunity that Web 2.0 allows for us educators to improve math lesson collaboration. Right now there are literally thousands of web sites offering lesson plans, projects, activities, Webquests etc. each claiming to be aligned with the Standards. But is this explosion of resources making a difference in how teachers teach and learn mathematics? All that depends on the quality use of the activities and software tools that we have at our disposal. Making the right curriculum choices including software & accompanying activities continues to challenge us. What might help is a bit of hand-holding. So how can Web 2.0 help make the activities be more coherent, focused, and well articulated? One powerful way to make an activity more effective is to take advantage of web-based learning objects that usually come in the form of an applet or Flash program. There are literally hundreds (if not thousands) of them out there on the Web and new ones are being created daily. So what’s a time challenged teacher to do? You can Google for math applets on the web that focus on your topic of interest and use of technology. A more time efficient way is to search through popular collections of applets developed by groups of educators. The Virtual Manipulative Library, Shodor Interactive, and of course the Illuminations site that NCTM provides come to mind. But how do you use them in your classroom? 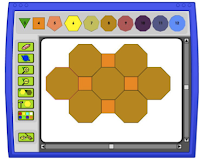 Each of the sites mentioned have lesson plans associated with the applets but these tend to be very general and rarely is there any feedback available from teachers who have used them. 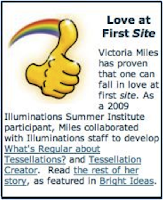 A couple of weeks ago I read NCTM’s new on-line Illuminations newsletter Bright Ideas which featured the article Love at First Site describing how Vicki Miles a math teacher from Massachusetts parlayed her interest in the Illuminations applets to become a participant in an NCTM sponsored Illuminations Institute where she created a tessellation lesson around an applet designed to help students explore tessellations. In thinking about how to use this applet in my work with teachers, I had some questions about the lesson and wanted to get in touch with the author. Unfortunately, there was no contact information for the her but I did eventually get her email address from another participant in the Institute who I recognized from a group photo a little further down in the newsletter. I know that NCTM is trying to encourage more online discussions and collaboration about topics relevant to math education through the use of Blogs, Twitter, Ning and Facebook, so I wanted a find a venue for a viable discussion around Illuminations activities and applets. 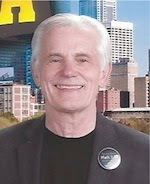 I found out via Twitter that Facebook is at the moment NCTM's preferred arena for discussions. Despite the fact that I'm not much of a Facebook user, I did go to NCTM’s Facebook site to see how the collaborative dynamics might work out. Here's what I posted to the discussion board. I wondered if this would generate (if any) discussions. (I'm writing this now more than 2 weeks later and still no one has made any comment.) I also revisited the Math Forum’s ambitious effort to create teacher collaboration around Math tools. It's full of good resources, but again its hard to get a group together to discuss issues around topics of interest. 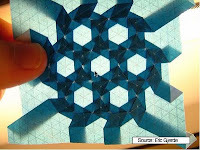 I did find some posts about Tessellations as a topic which included lots of good resources but not a lot of discussion about them. So the bottom line here is that I’m looking for effective ways of collaborating on building effective lesson scenarios using dynamic math tools that generates lots of input from interested educators. I'll be posting some examples of what I have in mind at CLIME's new Wiki. Please share your ideas about this by replying with a comment below. 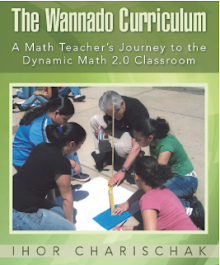 Math Educator Blogs of Note. Scott McLeod started a wikipage encouraging math folks to post their favorite Math blogs and bloggers. It’s now just another lost item in cyberspace. I’m reviving it by updating the list to have as part of the CLIME directory and have some monitoring going on. Here is CLIME’s version (open for your editing). OnMath NCTM’s technology based journal is no more. Cal Armstrong who was on the OnMath Editorial panel is now on the Math Teacher Editorial panel working towards adding more tech and Web 2.0 features to their long time journal. I assume a lack of readership did OnMath in. I hope the Math Teacher will be able to overcome the loss and create something even better. Math 2.0/FutureMath Weekly Webcast. Maria Droujkova leads a lively weekly Wednesday session hosting pioneers in the field who do presentations and lead Math 2.0 related discussions in various webcast environments (i. e. Elluminate, WizIQ, etc). I try to attend as many of these as I can. they're fun. Everyone is there to learn and help others to become more familiar with how these tools work. This gives us a peek at what 21st century conferences are becoming. Schedule of weekly events at Math 2.0.